William James Russell born in Gullane in 1909, son of Sandie Russell, Starter at Gullane golf course, and his wife Agnes. W. J. 'Bud' Russell was educated at North Berwick High School and trained as a club maker with Jack White in his two storey workshop in Goose Green Mews, Gullane. Jack White won the Open Championship in 1904 and returned to Gullane in 1927 after being pro at Sunningdale for twenty five years. White also had a successful golf equipment shop at 2 Rosebery Place, Gullane. Bud Russell had a brother and two sisters and lived with his parents in Middleshot Road, Gullane. Bud was a member of Dirleton Castle Golf Club and playing off a handicap of two, won the Austin Trophy in 1930. At school his nickname was 'boy' and when he started his apprenticeship with Jack White, it was Mrs White who suggested that young Russell had outgrown his nickname and should be called 'Bud'. In June 1930, Bud Russell answered an advertisement in the Journal of the Professional Golfers' Association, which read: Professional required for Barwon Heads Golf Club, Geelong, Victoria, Australia. Scotsman preferred. £150 per annum, house workshop rent free, passage paid to £40. Two years engagement, extending if suitable, if terminated within twelve months passage money to be repaid. Main qualification coach of outstanding ability, age limit 35. The advert attracted dozens of applications from England, Scotland, France, Sweden and India, The club secretary at Barwon Heads, Harry Hay enlisted the help of Stanley Melbourne Bruce, who was in London with his family's importing business after completing seven years as Prime Minister of Australia. Bruce asked James Braid's advice and the shortlist was reduced to two, Bud Russell and a young lad from Troon. On 27' July, Russell was brought to London for an interview and the following day Stanley Bruce (Later Viscount Bruce) cabled Hay with the news: Have selected Professional-Scotch single-twenty-two. Hay wired approval, cabled £40 passage money and 'Desire early departure'. Bud sailed on 5' September on the Royal Mail steamer Mongolia, arriving at Port Melbourne on 13 October 1930 with 25 shillings in his pocket. He left a millionaire. Russell set about increasing the turnover of the pro shop with shrewd merchandising. He took a huge risk ordering £1,000 worth of Scottish knitwear and according to George Gibson, the manager of the George Nicoll foundry at Leven, Fife, in Scotland, Bud's orders of 1000 heads at a time were unique. Large crates of Nicoll and Brodie Graves clubs came to Barwon Heads for resale to other professionals as well as to his own customers. Bud Russell lived in a small whitewashed cottage, he called 'Gullane' a three wood distance from the pros shop. He returned to Scotland in 1937 and played in the Open Championship at Carnoustie. He served in the RAAF in the South Pacific during WW2, reaching the rank of sergeant. In the 1960's he was granted permission to enter the member's clubhouse for the first time. An old fashioned rule today, but a significant gesture by the committee a decade before other Australian golf clubs. Also in the 1960's, Bud welcomed Jean Donald from North Berwick to Victoria. She was the first Lady professional in Scotland and played an exhibition match at Barwon Heads. 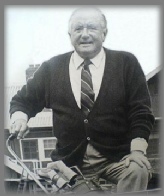 In 1977, Bud Russell was conferred Honorary Life Member of Barwon Heads Golf Club and was acknowledged among the Queen's Honours with a B.E.M. in 1982 for services to golf and his community. Bud Russell retired after 57 years with the club and died in 1997, aged 88 years at Geelong, Victoria.